Mismaloya is where the famous mid-'60s film Night of the Iguana was filmed. Its scenery is truly cinematic, with glorious golden beaches, calm turquoise waters, and a verdant jungle backdrop. There are plenty of things to see and do here, and there are also many choices for accommodation. If you've ever tried to find quality lodging with a generic search engine, you'll know how tedious it can be to filter tens of thousands of results in search of the appropriate resort or hotel. 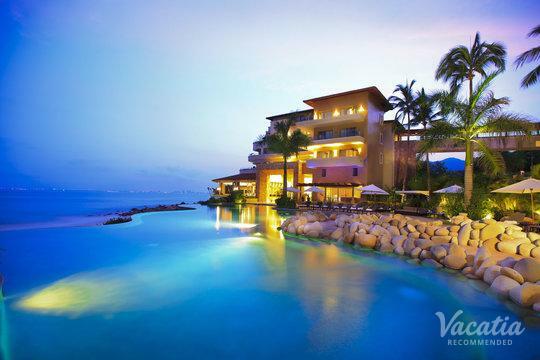 If you want to find highly recommended Mismaloya resorts or hotels quickly and easily, you should work with Vacatia. Our comprehensively organized listings make finding top-rated Mismaloya hotels and resorts an enjoyable and hassle-free experience. Mismaloya will impress with its perfect balance of indulgent luxury and rustic simplicity. This variety is mirrored in its choices of accommodation, which range from high-end hotels and resorts to charming vacation rentals. If you simply can't decide between one or the other, you can book one of our resort residences. This one-of-a-kind accommodation offers the best of both worlds. You will get all the services and amenities of a resort in addition to home comforts and stylish furnishings. You'll be able to cook your own meals in a fully equipped kitchen, but you'll also be able to splurge on a gourmet on-site restaurant. Professional staff will take care of the daily chores, but you'll get your own in-unit washer/dryer for quick loads of laundry. Experience comfort and luxury when you book with Vacatia. Mismaloya consists of a small beach and village. Its name comes from "michamaloyan," which translates from Nahuatl as "place where you catch fish with your hands." With its beautiful forest-fringed cove, Mismaloya is just nine miles from Puerto Vallarta. It is nestled between Boca de Tomatlan and Conchas Chinas, which both make for fantastic day trips. There are many small local restaurants here that serve delicious food. Head to a beachside palapa to enjoy a freshly grilled fish and a cold cerveza. On one end of the Mismaloya cove, you'll find the large Barcelo Puerto Vallarta resort that was used for the set of the famous Richard Burton film Night of the Iguana. Mismaloya's splendor of palm trees, sapphire seas, and golden sands is set against a backdrop of mountainous jungle full of exotic fauna. Book one of our Mismaloya rentals today to secure high-quality accommodation in this stunning destination.